NEW FOR 2018! “contact” options now nightly! Don’t get scared easily in haunted houses? Looking for that extra adrenaline pump or excitement to take your haunted house experience to the next level? Then our special event “Contact” option is just the thing for you! Designed for the most seasoned haunters and those who don’t seem to get that thrill from traditional haunted houses, our optional “contact” will get your heart pumping and your palms sweating! The rules are simple. Accept a FREE red glow necklace at the entrance, secure it around your neck, and this will signal to all the creatures within that you submit to actual physical contact within the dark realms of Brighton Asylum. You are within complete control of the experience. If at any time you want the physical contact to stop, just discard the necklace. NOTE: You must be wearing the necklace around your neck for physical contact to take place. 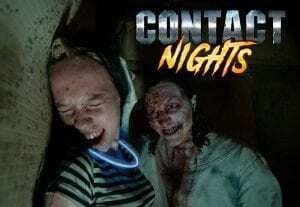 Brighton Asylum’s “Contact” option is completely safe for those who do not wish to take part in the increased intensity, but want to watch their brave friends get in on the action. Simply do not accept the glow necklace at the entrance, and you will experience the attractions like you would on any other night – contact free! During Brighton Asylum’s “Contact” opt in, you may be subjected, but not limited, to the following: forced separation from your group or path, simulated abduction, physical contact, contact with water, crawling, physically being picked up, etc. This event is NOT recommended for pregnant women, people with heart conditions, respiratory problems, back and neck problems or ANY muscularsketetal problems of any kind, balance problems, anxiety conditions, claustrophobia conditions, and other medical conditions that could be made worse by these situations. Those with medical braces of any kind will be refused admission for safety reasons. We are wheelchair accessible. -No smoking, alcoholic beverages, weapons, pets, cameras, flashlights, over sized purses, high heels, flip flops, laser pointers, or anything that could poke or stab our actors as they come into physical contact with you are permitted inside the attraction. Guests will be screened before entering. Anyone deemed unfit for entry will be denied admission without refund. -No videography or photography inside the attractions. -Leave the expensive items and wardrobe at home or in your car! We are not responsible for damaged or lost property. If there are any rules that you do not follow, you will be asked to leave. Still have questions? Visit Brighton Asylum FAQ page or Contact page.